Design patterns have become a staple of object-oriented design and programming by providing elegant, easy-to-reuse, and maintainable solutions to commonly encountered programming challenges. However, many busy Java programmers have yet to learn about design patterns and incorporate this powerful technology into their work. This book is exactly the tutorial resource you need. Accessible and clearly written, it helps you understand the nature and purpose of design patterns. 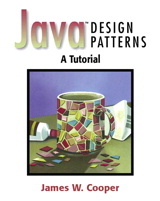 It also serves as a practical guide to using design patterns to create sophisticated, robust Java programs. This book presents the 23 patterns cataloged in the flagship book Design Patterns by Gamma, Helm, Johnson, and Vlissides. In Java� Design Patterns, each of these patterns is illustrated by at least one complete visual Java program. This practical approach makes design pattern concepts more concrete and easier to grasp, brings Java programmers up to speed quickly, and enables you to take practical advantage of the power of design patterns. James W. Cooper is a research staff member in the Advanced Information Retrieval and Analysis Department at the IBM Thomas J. Watson Research Center. He is also a columnist for Java Pro magazine and a reviewer for Visual Basic Programmer's Journal.